Return to to main page on Selecting competition boules. Elasticity is basically a way of describing how “bouncy” a boule is. When a boule hits the ground or another boule, the pressure of the collision deforms the boule. A boule’s elasticity is its ability to recover from such a collision and return to its original shape. A boule’s “elastic limit” or “yield point” is the greatest amount of pressure that it can take without breaking or being permanently deformed. Engineers determine a boule’s elasticity by putting it in a big press and mashing it under greater and greater pressure, until they find a pressure where the boule breaks or stays permanently mashed out of shape. That pressure is the boule’s elastic limit. In the USA we usually express pressure (tire pressure, for instance) in pounds per square inch (p/i² or PSI.) France uses the metric system, so French boules manufacturers express the pressure of a boule’s elastic limit in kilograms per square millimeter (kg/mm²). The higher this number is, the more bouncy a boule is. A very “soft” (low-bounce) boule has an elasticity of 110 kg/mm², while a very “hard” (high-bounce) boule has an elasticity of 140 kg/mm². When Obut discusses “hardness”, what it means is elasticity. The technical term for “scratch resistance” is “penetration resistance” or “indentation hardness”. Basically it is a measure of how likely it is that your boule will get scratched or gouged if it hits a sharp rock on the terrain. Engineers test the scratch resistance of a boule by taking a diamond with a standard angle of sharpness and pressing it into the boule with a standard amount of pressure. This makes a hole in the boule. How deep the hole is tells you how hard the boule is— the softer the boule, the deeper the hole. The standard way to express penetration resistance is a dimensionless number called the Rockwell C hardness index (HRC, or HrC). For safety reasons, the FIPJP requires all competition boules to have an HRC between 35 and 55. Is there any correlation between elasticity and scratch resistance? Yes. There is a rough correlation. Or at least there used to be, back in the good old days before manufacturers started playing with new steel alloys and “anti-rebound” technologies (see next section). Back then you could map an elasticity number to a scratch resistance number. Here are the numbers, from soft to hard. Generally speaking, petanque players (and especially shooters and high-lob pointers) want boules that are both hard (durable, scratch resistant) and soft (low-bounce). 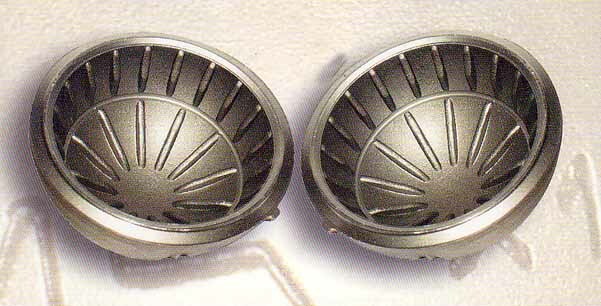 To satisfy this desire, skilled boule-engineers have devised ways to make boules that are BOTH hard (scratch resistant) AND soft (low-bounce). The exact details of how they do this are of course trade secrets. Different manufacturers do it different ways. One way is to use special steel alloys and special tempering techniques. When this is done, the boule may be described as being made of “SPECIAL carbon steel” or “carbon steel ALLOY” (allié au carbone). 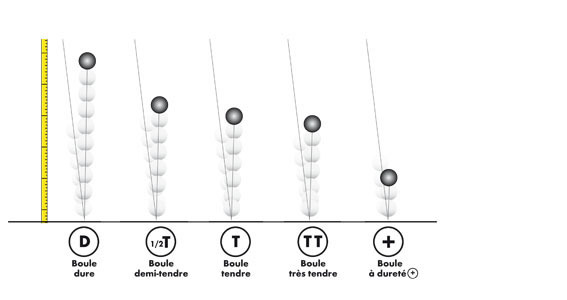 Another way to do it is to specially design the boule’s surface and/or interior structure to reduce bounciness. This is how MS Petanque does it with their MS 2110 boules. Obut invented a new term for such boules— dureté+, or in English “Hardness +”. You can see the label dureté+ in the first two pictures in this post, which come from the Obut web site. Obut’s high-end dureté+ boules are the RCC and RCX, where RC stands for Rebond Contrôlé— controlled rebound. (“C” = carbon, “X” = inox, stainless steel). MS Petanque offers the “MS 2110 anti-rebound” model. The “110” part of the name indicates the boule’s elasticity— 110 Kg/mm². Presumably the “2” prefix indicates anti-rebound technology. It is important to realize that there are no precise, industry-standard definitions for words like “hard”, “soft”, “semi-soft”, and “very soft”. They really indicate no more than the relative softness of the different models available from the same manufacturer. A degree of elasticity or penetration resistance that one manufacturer calls “soft” might be called “semi-soft” or “very soft” by another manufacturer. What hardness should I choose? For your first set of competition boules, we recommend harder boules. Harder boules tend to be cheaper than softer boules, and they are less likely to develop gouges and burrs if you play on surfaces with hard, sharp rocks. Until you become very skillful, the hardness of your boules is going to make no real difference in how well you play. For advanced players, soft or semi-soft boules may be a bit easier to control — although we DON’T buy into that old wives tale about softer boules being more likely to produce carreaux. Expensive boules with advanced anti-rebound technology are appropriate only for very advanced players, or players with money to burn.